Sometimes a cultural practice is so intrinsically linked to a single place that the two things seem inseparable. 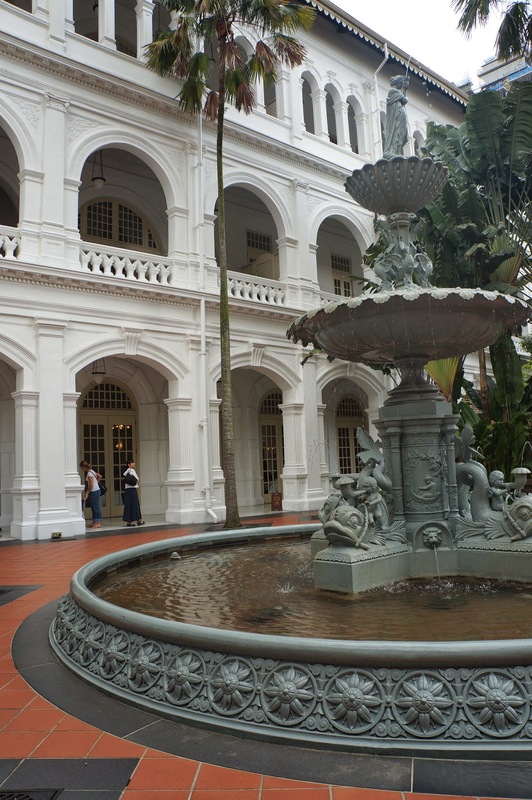 Such is the case of High Tea and the Raffles Hotel in Singapore. 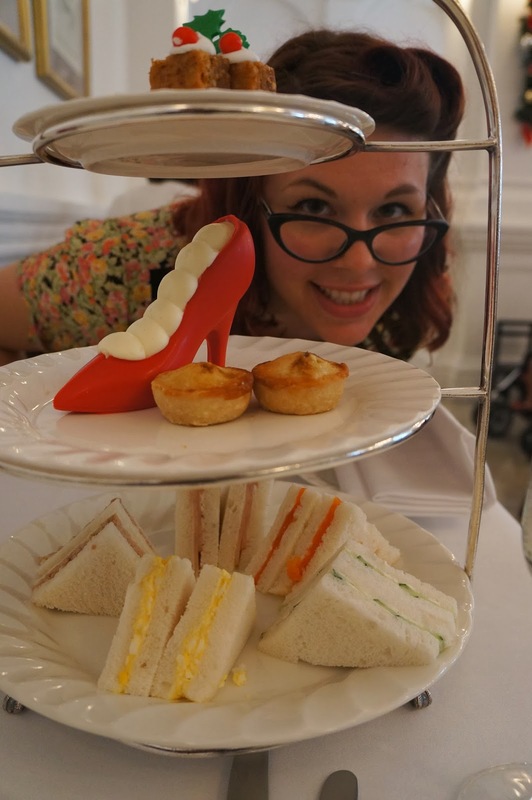 High Tea in proper British parlance is the working class equivalent of dinner, however in Singapore and other former British colonies High Tea has come to mean a very cultured and proper afternoon tea of scones, finger sandwiches and cups of tea served in the late afternoon. 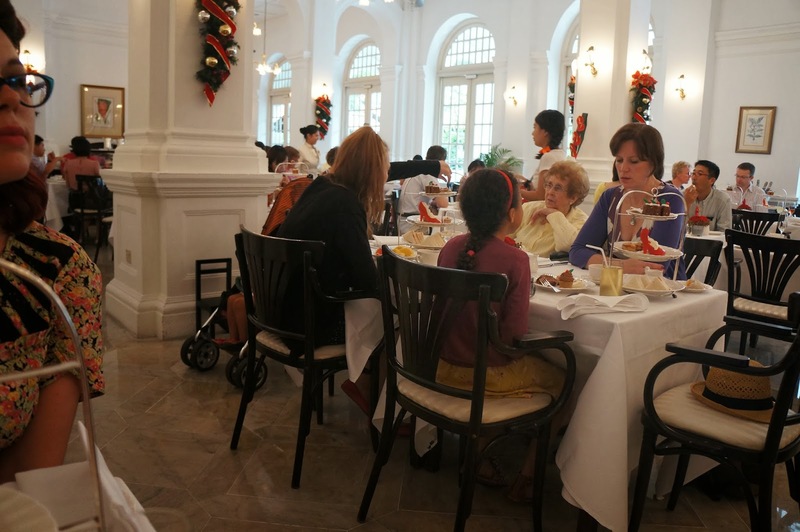 In Singapore High Tea remains a popular institution long after the end of the colonial period, and that most grand of colonial-era hotels - the Raffles - has a long held a reputation as the place to go. 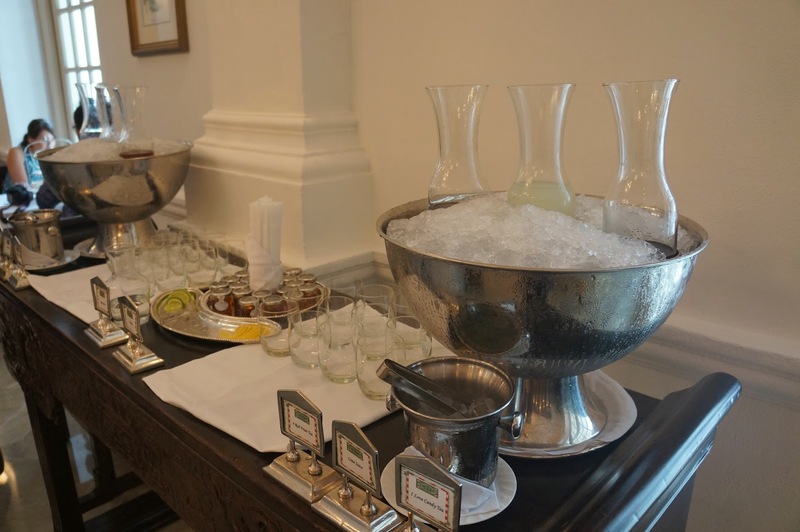 For as long as I've heard of its prestige as a child, I wanted to one day have High Tea at the Raffles and the occasion of Alissa and my honeymoon seemed like as perfect a time as there ever could be. By this stage I'd worked out that the horrendous wall of humidity that Singapore has as a climate was not good for collared shirt wearing (required for entry at the Raffles), and Alissa had to reapply some make up for the same reason of sweatiness. Using the very luxe bathrooms in the courtyard, I put on the collared shirt I was wearing while Alissa touched up her make up before we approached the Tiffin Room. As we were escorted through the large, high ceiling room with superfluous fans (sadly, not the same as the famous Long Bar fans) the sound of a harpist filled the air with Christmas carols and background music standard fare. 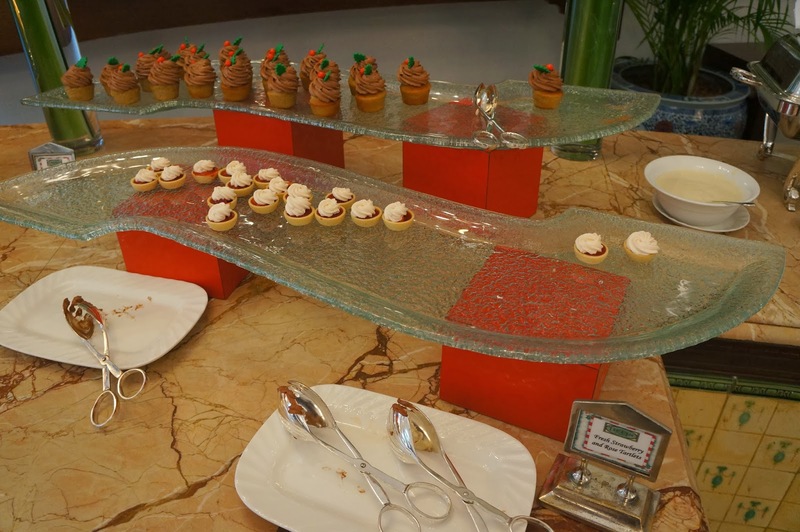 We were sat at a table near the right side of the buffet, and given that this was the Christmas High Tea our multi-tiered cake stand featured fruit mince pies, fruit cake and a red white chocolate shoe filled with cream alongside the more standard assortment of sandwiches. Alissa went to go get scones and sweet things while I started with savouries. How different our food priorities are. The sandwiches - ham, smoked salmon, cucumber and cream cheese, egg and tuna - were sadly very ordinary. I know they're are probably sticking to a long held traditional style, but these were sandwiches anyone with a loaf of ordinary white bread, the fillings and a knife could put together fairly easily and when compared to how amazing sandwiches are in Vietnam it seemed a little lazy and uninspired considering the price we were paying ($78++ each, which was even higher than usual due to the Christmas period). 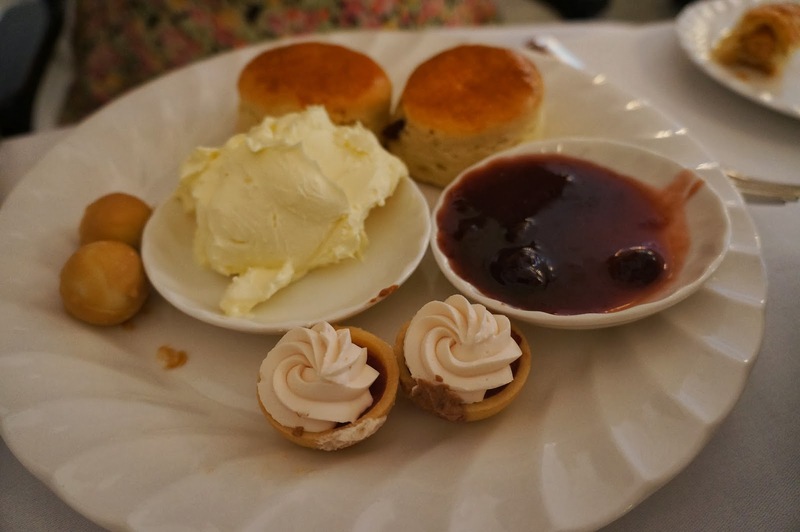 Anyway, Alissa returned with her plate of sweet things - the classic jam, cream and scones, a Strawberry and Rose Tartlet and another item I cannot for the life of me remember what it was. The jam and scones were good, nothing amazing but tasty enough. They were neither the best nor the worst either of us have ever had, and the sweets were again okay but not necessarily memorable - obviously, as I even forgot what one of them was! 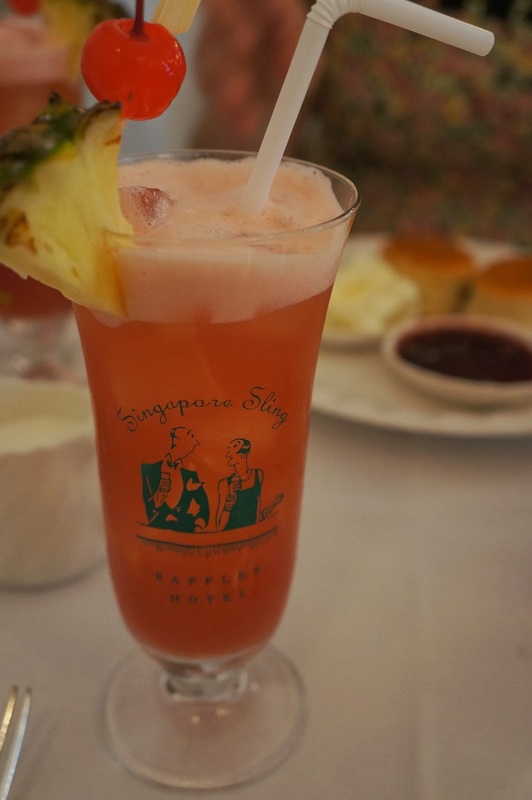 Being that this was our honeymoon, we decided that we would order the most classic of Raffles drinks - the Singapore Sling. Invented in the Long Bar by bartender Ngiam Tong Boon sometime in the early 20th Century, the true recipe is still something of a secret though internet sources (read: Wikipedia) suggests that it was heavily modified in the 1970s and is now more often than not premixed mechanically, even for service at the Raffles(!). The cocktail we had was very tasty, but again just not memorable. We'd had similar drinks at Ambrai in Udaipur, similar but better drinks at Indigo in Mumbai, even better drinks at the Gin and Tonic Bar in Hong Kong and the best cocktail of our entire trip at Don's in Hanoi. Perhaps its because it is so famous its much copied or perhaps the premix process has ruined some of its more subtle nuances, but the combination of pineapple juice, gin and cherry brandy (among others I couldn't quite detect) was a fairly stock-standard cocktail that was neither simple enough to highlight the individual flavours (eg something like a gin and tonic or a martini, where the quality of the gin shines through) or complicated enough to become greater than the sum of its parts (like the incredible Pho cocktail at Don's). 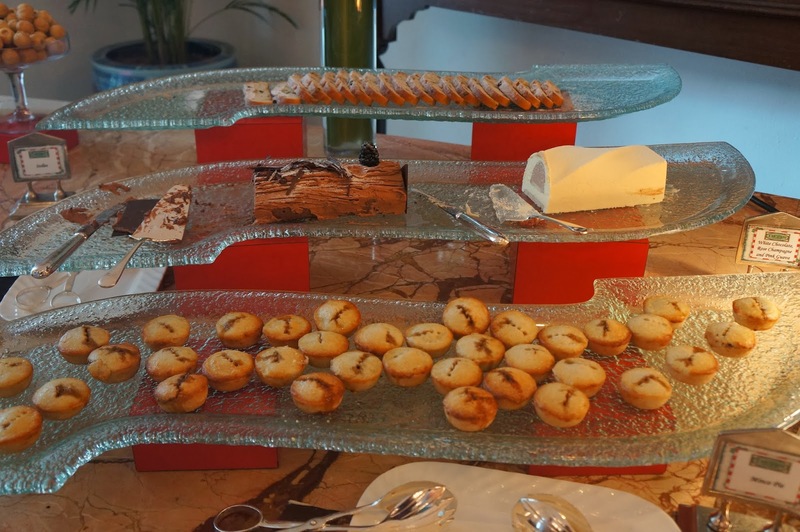 After a few sips I went to investigate the spread of food, and to get myself a savoury plate. The lights shining down on the savoury pastries were what I thought were hot lights, however based on the fact the sausage rolls were only slightly warm meant that these items were not the best. 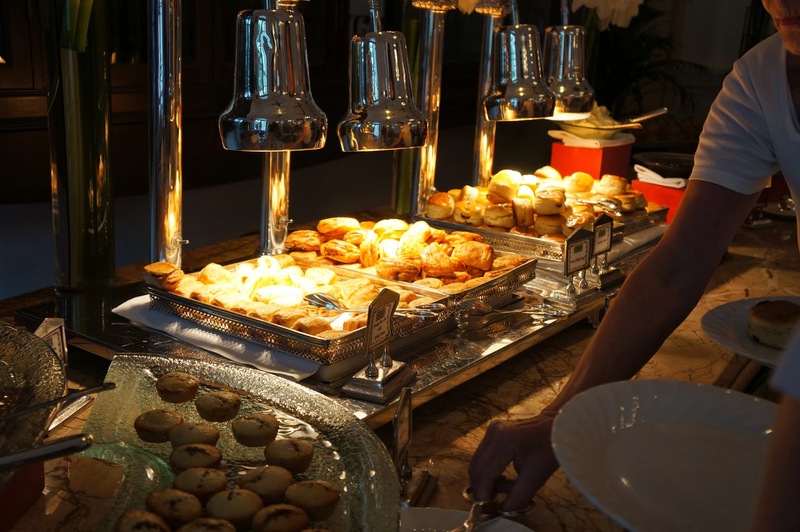 I'm a bit pedantic about food being served at the right temperature, and as a fan of hot sausage rolls this was a disappointing reminder of why I'm not a huge fan of buffets when these things have not been fully considered. 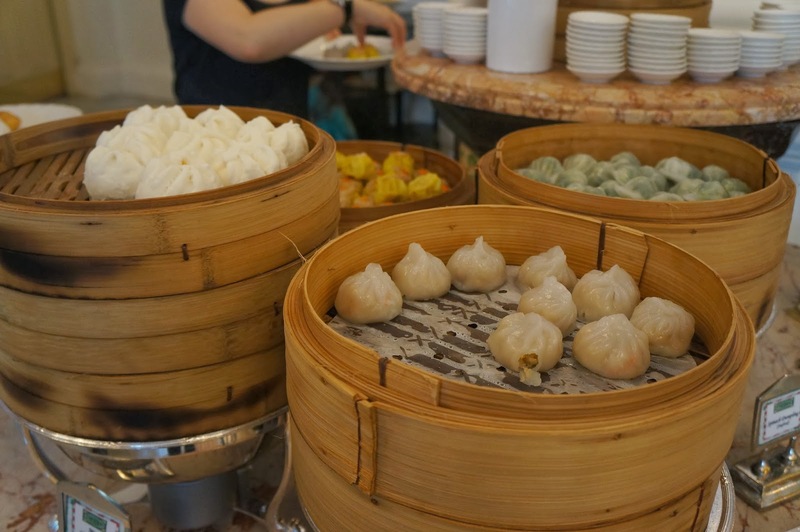 The dim sum spread was served at a correct temperature. I didn't try the char siu bao, but I did try all three dumplings. The har gao-like dumpling was actually vegetarian and was okay, as was the chive dumpling. The siu mai was a bit better, being tasty enough although being made from chicken rather than pork it lacked some of that delicious porkiness I expect from siu mai. That said, I did go back for more of them. I'll give them kudos for one thing - the fruit selection was very good. 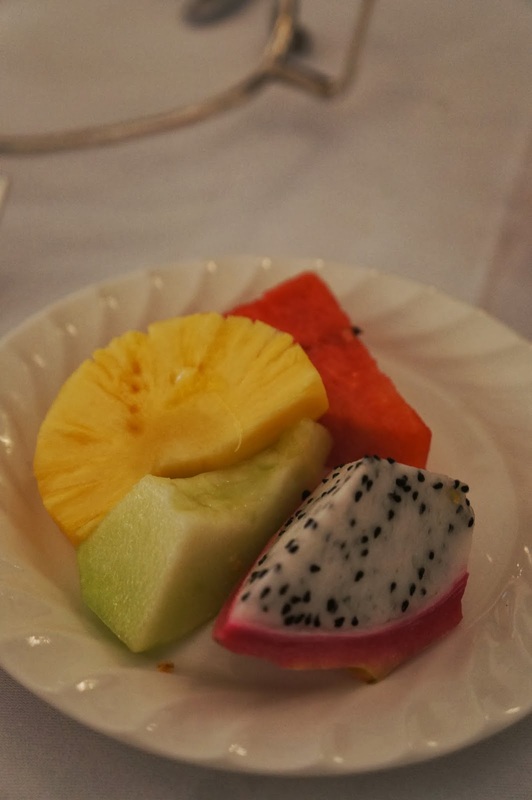 All four fruits - pineapple, watermelon, dragonfruit and melon - were very sweet and refreshing. This obviously does not take a great deal of culinary skill, however it must be said that whoever their supplier is had given them very good fruit. 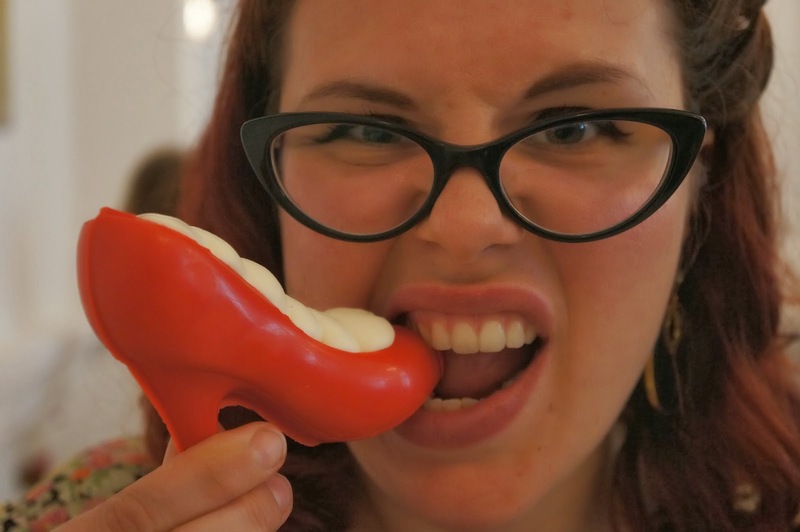 We noticed diners on other tables had been sheepishly avoiding actually eating the red coloured white chocolate shoe, so Alissa and I decided to give it a go. 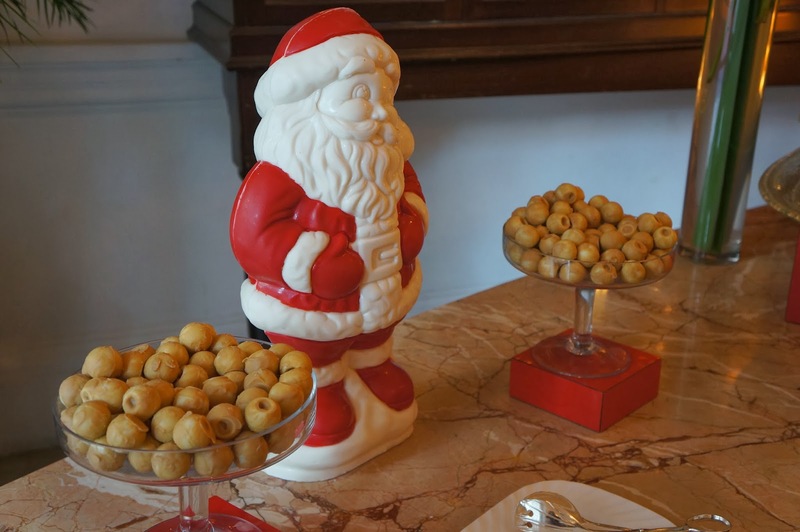 The chocolate was tasty, with small crunchy chocolate balls hidden within the cream filling. Probably one of our favourite of the sweet items. By this stage I was feeling a bit full and disinterested in the food, however I took some additional photos of some of the other items available before heading to the ice tea station. This was genuinely very good, having a selection of a few ice teas which could be tailored to taste with honey, lemon juice, sugar syrup, ice, and lime and lemon wedges. One of my pet hates is paying a lot of money for a meal I could have easily whipped up myself. Hence why I'll happily fork out over $600 AUD for a meal for two at Caprice but complain about paying the unacceptable $6 for two piece of toast and pre-packaged jam and butter some breakfast places in Perth think is a reasonable price to charge for putting a piece of pre-sliced bread in a toaster and then putting it on a plate. While nothing at the Raffles was that bad, the prices they are charging for their food does not correspond with the quality I would expect at this price point - the food was only on average good, with the sausage rolls being only okay. What you're paying for is to sit in a nice room, but I've sat in nice rooms in a lot of restaurants where I felt the price was justified (see Caprice, Dum Pukht and the Chocolate Buffet at the Metropole in Hanoi) and frankly, I'd rather an delicious meal in a place with spartan surrounds than waste time on something that is not particularly special. 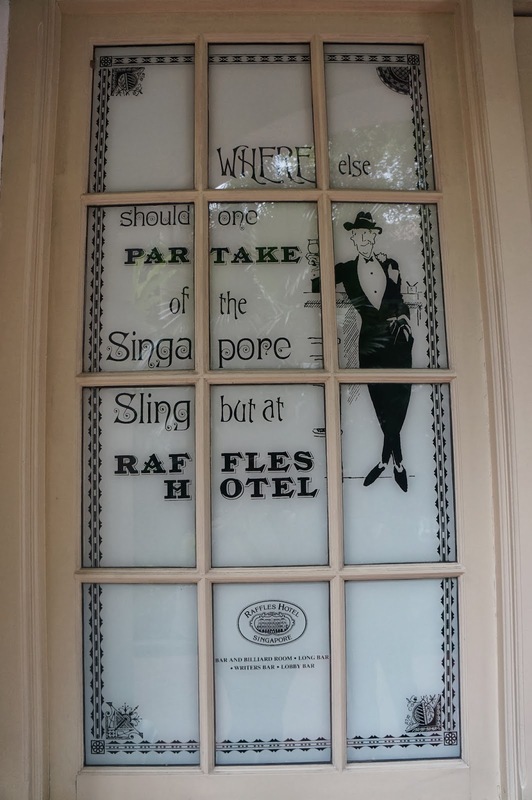 Sadly, I feel the Raffles resting on their historical laurels means that unless sitting in a nice room with harps playing in the background is your thing I can't really recommend the Tiffin Room High Tea.